After nearly a decade building energy-efficient and green homes, builder RDC Fine Homes, Inc. is taking energy efficiency to the next level. 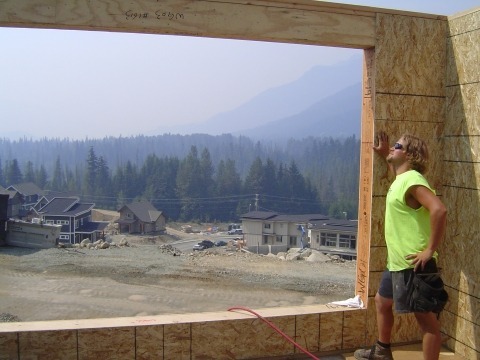 Whistler, British Columbia-based RDC has partnered with Insulspan® and homeowners Richard and Jennifer Wyne to build the Whistler Vision house, a green, net zero energy home that will be on display during the 2010 Olympic Games. The goal? The home must produce enough energy to result in net zero energy consumption over a period of one year. However, the home must blend into the surrounding neighborhood, and be practical for a family lifestyle. One of the critical elements of the home’s energy-efficient design is a well-insulated and airtight building envelope. Therefore, Plastispan® EPS insulation was used beneath the home’s concrete slab. Additionally, the Advantage Insulating Concrete Forms (ICFs) System® provided insulation for the foundation walls. RDC specified the Insulspan® Structural Insulated Panel (SIP) system for the walls of the home. In addition to increasing the thermal efficiency of the building envelope, Insulspan’s ready-to-assemble system cuts down on framing time and helps reduce the cost of energy-efficient construction. The Whistler Vision house uses both active and passive solar technologies. It also uses a state of the art zoned ventilation system with a heat recovery ventilator. RDC sought to reduce material and water usage by using polished concrete floors and low flow fixtures throughout the home. Rooftop photovoltaic solar panels will generate all the electricity the home requires.